More than a dozen wildfires whipped by powerful winds have swept through northern California’s wine region. The flames have destroyed thousands of homes and forced more than 20,000 people to evacuate. This video shows how the fire ravaged a local resident’s home in the area. Some reports say as many as ten people have died and several more have been reported missing. It’s not known what caused the fires which first broke out on Sunday but the state’s fire chief says an eight-county swathe of Northern California, including Napa, and Sonoma counties are ablaze. Santa Rosa, the largest city in the fire area with a population of about 175,000, has been hardest hit . Patients from two hospitals have been evacuated to safety while homes and businesses in the surrounding areas have been burnt to the ground. 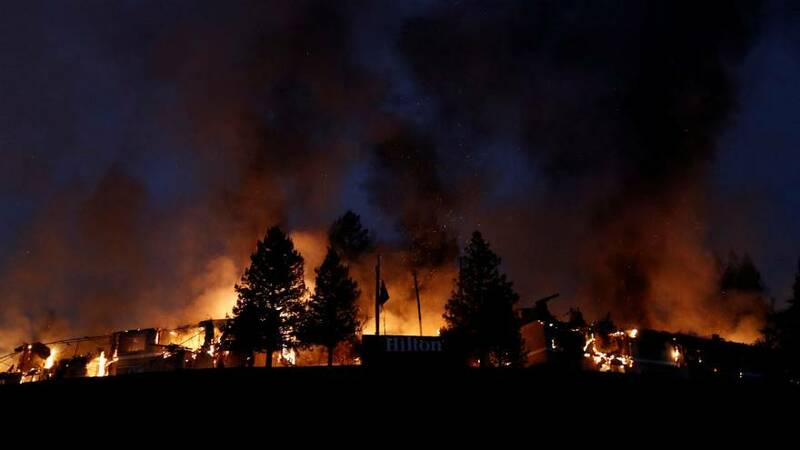 A well-known hotel was left smoldering in the ruins. A state of emergency has been declared in the region as fire fighters continue to try to bring the flames under control. My heart is with the families of the 10 souls we have lost to the Northern California fires. Your Senate stands ready to help. praying for the safety and well-being of everyone affected by the fires in California, including friends, family and first-responders.